With the F-14D, the Navy finally got the aircraft it had originally wanted. The somewhat anemic TF-301s were replaced with much more powerful GE F-110s. Also upgraded were system avionics and the ejection seats just to name a few items. Unfortunately, the cost of the aircraft was, for the time, very expensive so only a small number were built new, while some older airframes were upgraded to F-14D standards. The serials of these older aircraft remained the same, but the rebuilds were referred to as F-14Dr aircraft with the r showing the rebuild status. This is the sixth 1/48 F-14 kit that has been presented to the buying public. First was the Monogram kit then the Fujimi kit, then Hasegawa, Academy and finally the Italeri kit. Most modelers will agree that the Hasegawa kit was the best available in terms of detail, but the Monogram was probably somewhat easier to build. 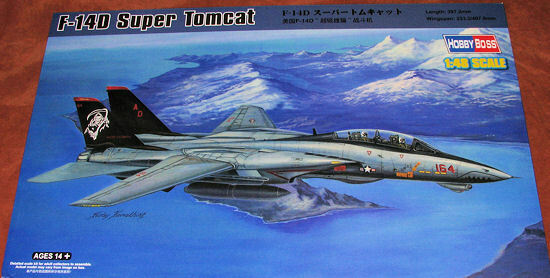 In truth, no 1/48 Tomcat has been really easy to build. 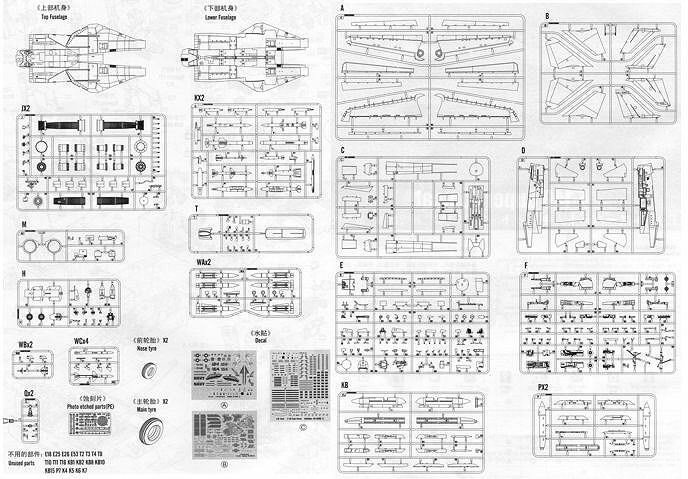 All of them have suffered from various problems with fit and only those few folks who have built dozens of 1/48 Tomcats (yes, I mean you, Darren), have figured out how to breeze through construction. 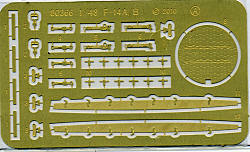 This kit is basically an upgrade of the earlier F-14A with all the right additional bits and pieces to make an F-14D. It features fine engraved rivets and panel lines, well detailed tandem cockpits with nicely done bang seats, radar package face and antenna (with optional open radome), cannon bay interior, optional position slats and flaps, intake trunking, fully detailed	 engines, optional position multi-part canopy, refueling probe, optional deployed boarding steps, separate speed brakes, very nicely detailed wheel wells and landing gear, vinyl tires and a nice photo etch fret for the radar array, seat harnesses and the canopy rails. The interior instrument panels and consoles have nicely done raised detail and decals that one can use if that is the desire. Like almost every Tomcat kit, the forward section is split vertically with the aft split horizontally. You may be pleased that the wings are not interconnected, at least not that I could determine from the instructions. There are different pieces to fit into the fuselage at the wing root depending on if you build the kit with the wings swept forward or back. Both wide open and closed exhaust nozzles are provided. Tomcats normally shut down one engine first and then the other, which results in one set of burner cans being wide open while the other are closed. Look at photos to verify this. Frankly, I'm not sure why Hobby Boss provided full engines as you won't see them when the kit is finished. From the final compressor aft would have been enough. The kit does include a full weapons suite, including different wing pylons if you wish to mount a pair of Phoenix out there. You get four Sparrows and two Sidewinders as well as a pair of drop tanks. The instructions are well done with the usual nicely drawn construction steps. There is a list of parts that won't be used on this variant, which is nice to have. A full color painting and markings guide is offered for two aircraft, both in the Tactical Paint Scheme of greys. One is the box art plane from VF-101, the final F-14D training unit in CAG colors with a black tail and a VF-111 style shark mouth. The other is for an aircraft of VF-213, which was one of the last two units	 to fly the aircraft. This one has the lion nose art that you may have seen on the Revell USA boxing of the 1/72 version of this aircraft. 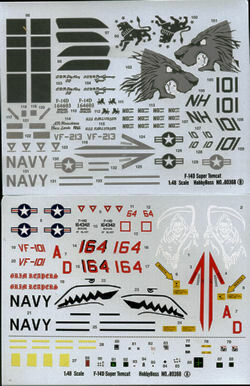 I have only shown the decals for the aircraft markings. There is an additional sheet for the weapons markings. While I am at it, the weapons load includes JDAM and GBU bombs as well as Mk 82 iron bombs and pylon mounted seeker. The decals are well printed and I've found them to be quite good when I've built Hobby Boss kits. I'd be remiss if I didn't mention the excellent packaging. In addition to the usual careful bagging of the sprues, there are two additional boxes within. One is compartmentalized for the upper and lower fuselage halves and the other contains the clear pieces, tires, intakes and a few other pieces. The tires with this kit are rubber instead of the usual plastic. As usual, some of the more delicate bits are wrapped for additional protection. So now we have another player in the 1/48 Tomcat game. Is it the best so far? Well, it certainly looks very nice and it couldn't be any more difficult to build than the Hasegawa kit. It offers a bunch of options that will appeal and includes weapons that are separate items with some other kits. Two nicely done markings in the box and a ton of aftermarket decals that should fit make for a very attractive new kit. Thanks to Squadron Products for the preview kit. Get yours at your local shop or on-line retailer.